Amid what's already been a roller-coaster year for the diocese of Knoxville, word began filtering in from East Tennessee last night that freshly-installed Bishop Rick Stika had been hospitalized with an undisclosed "medical emergency." In a late-night statement, the Knoxville chancery reported that, taken ill on "visiting a sick friend" in an undisclosed location, Stika was in intensive care in stable condition, underscoring that the bishop was "responsive and doing well." Named to lead the 60,000-member church in January, the 52 year-old (shown lacing up before his March ordination) has spent most of August in San Antonio for a Spanish immersion course, a step toward fulfilling his goal of preaching in the language by year's end. Joining Stika for the training was a fellow St Louisan recently given a heavily-Latino assignment, Archbishop Tim Dolan of New York. As public information on the bishop's illness has been kept unusually terse, a host of rumors have circulated, the most common and credible indicating a heart attack. Diagnosed with type-one diabetes in his twenties and placed on an insulin pump in recent years, the statement said merely that the emergency was brought on by a "chronic medical condition." Stika underwent cardiac bypass surgery in late 2004 -- in a TV interview on his appointment, he joked that following the procedure, "the nurses [said] they could smell McDonald's and White Castle" as they "opened [him] up." "I've been trying to swear off the stuff," he added. Coming to Volunteer Country after a 21-month vacancy, the sweet, folksy cleric -- a protege of Philadelphia's Cardinal Justin Rigali -- has won over the small, tight-knit local church with his happy, approachable style. Three months after his arrival, the diocese was plunged into mourning after the sudden loss of Nancy Feist, the longtime bishop's assistant, who was expecting her sixth child when she died at 46. Scheduled to travel to Rome days later for the late-June pallium celebrations, Stika canceled the trip to keep present for his aide's family and a shaken chancery staff. 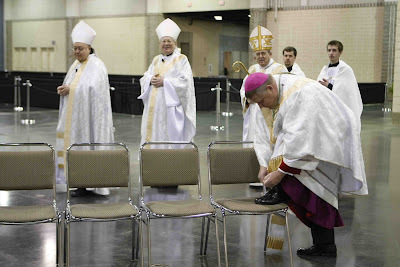 On Saturday, the bishop was expected to make his first major appearance since his ordination at Knoxville's annual "Diocesan Day," with Rigali giving the keynote. Speaking of the DL desk, Bishop Bob Lynch of St Petersburg is likewise on the mend after two surgeries in the last month following the discovery of a "large polyp" on his colon. The former USCCB general secretary -- who recently got a sneak peek of the newly-rendered Mass-texts in use -- was last reported to be in critical care, but improving. More as it comes in... but in the meantime, gang, just keep the guys and all the sick, suffering and downhearted among us in your prayers. As we now understand it, Bishop Stika traveled to Florida to visit a sick friend and became ill with severe flu-like symptoms, which precipitated a diabetic crisis. Although the Bishop suffered a mild heart attack related to the diabetic crisis, his heart was thoroughly examined and found to be in great shape. I am in contact with Bishop Stika’s doctors hourly and will continue to update you all as I get new information. Let us give thanks for this encouraging information and pray for his continued recovery.